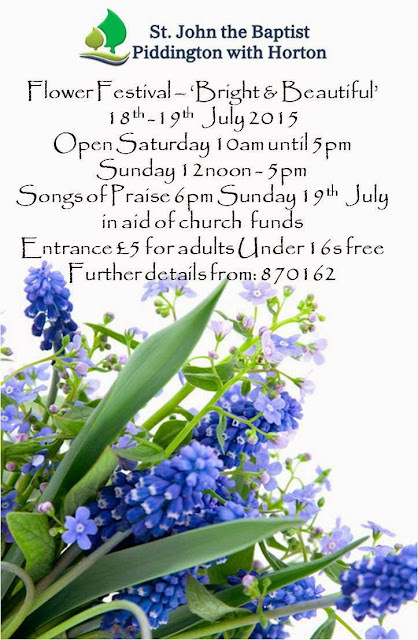 Please come and see the magnificent displays at St John the Baptist, Piddington and help raise church funds. We are also holding two open air services. Holy Communion at 11 am will be held in the churchyard. To end our glorious weekend join us in an open air Songs of Praise at 6 pm in the churchyard. On the 21st of June we held a service at St John the Baptist, Piddington, to welcome our Living Brook Benefice Team! Julie Austin and Julia Javes of Quinton along with Steve Watson of Piddington, received certificates and gifts to mark the completion of their training in Children's work, Home groups and Worship. They were welcomed by Revd Beverley, Heather Crudgington (our layreader) and our new curate, Deborah Marsh. After the celebratory service we enjoyed a round of cakes and coffee, before diaries were whipped out to arrange the first meeting!